In my experience, I’ve found that a pro/con list can help solve most problems. So if you’re on the fence about whether or not to indulge in today’s exceptional offer, simply take a gander at the list below, which I’ve taken the liberty of creating for you. 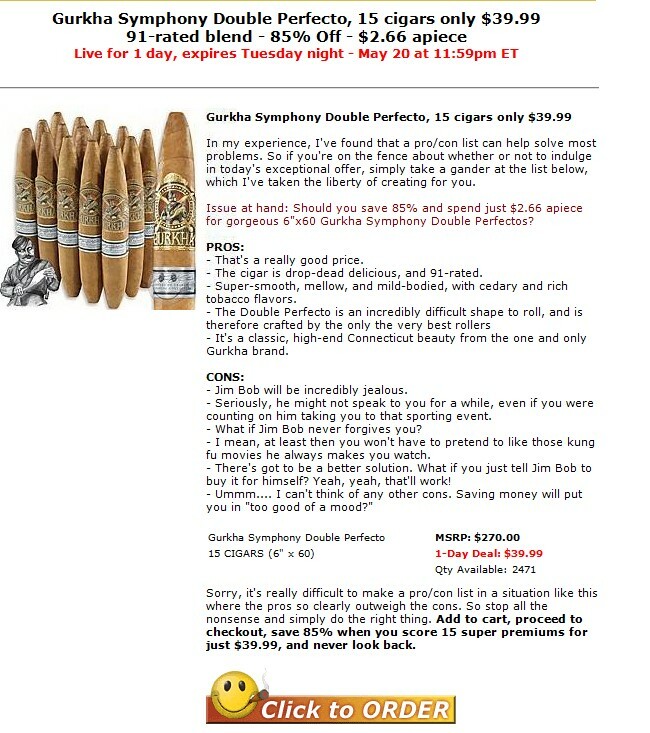 Issue at hand: Should you save 85% and spend just $2.66 apiece for gorgeous 6″x60 Gurkha Symphony Double Perfectos? – That’s a really good price. – The cigar is drop-dead delicious, and 91-rated. – Super-smooth, mellow, and mild-bodied, with cedary and rich tobacco flavors. – It’s a classic, high-end Connecticut beauty from the one and only Gurkha brand. – Jim Bob will be incredibly jealous. – Seriously, he might not speak to you for a while, even if you were counting on him taking you to that sporting event. – What if Jim Bob never forgives you? – I mean, at least then you won’t have to pretend to like those kung fu movies he always makes you watch. – There’s got to be a better solution. What if you just tell Jim Bob to buy it for himself? Yeah, yeah, that’ll work! Sorry, it’s really difficult to make a pro/con list in a situation like this where the pros so clearly outweigh the cons. So stop all the nonsense and simply do the right thing. Add to cart, proceed to checkout, save 85% when you score 15 super premiums for just $39.99, and never look back.